Professional Grade Vacuum Sealer Bags are only intended for commercial strength sealers and not "over the counter" bag sealers, that are found in sporting good stores, on TV or any other non-commercial grade outlet. Standard 3 mil vacuum pouch bags let you balance the needs of protecting and marketing your product with the ever increasing demands for cost efficiency. The commercial vacuum sealing properties of these bags are exceptional. 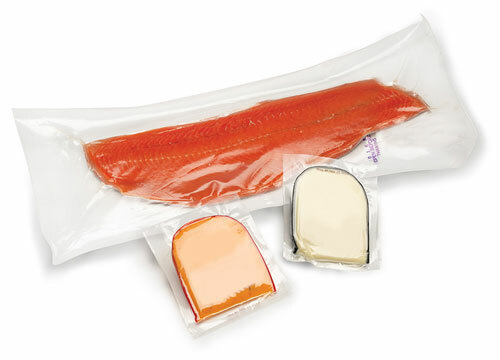 Our vacuum sealer bags are poly nylon pouch bags that allow for fill temperatures of up to 160 degrees and are very clear for presenting your products. Other features include great gas and moisture barrier qualities, consistent clarity, excellent side seal strength, and tear and puncture resistance. 3 Mil Commercial Vacuum Bags have excellent moisture barrier protection. All vacuum bags and pouches are AIB and Kosher Certified. Made in the U.S.A.